TH E M R EP O RT | 59 O R I G I NAT I O N S E R V I C I N G DATA G O V E R N M E N T S E C O N DA R Y M A R K E T THE LATEST GOVERNMENT Fannie Mae Stays Bullish Looking at 2017 The GSE maintains its 2 percent GDP growth prediction for the year. F annie Mae feels comfort- able that GDP will grow at 2 percent, as previously predicted, this year, even in the face of a potential rate hike. That's according to the GSE's March Economic Developments report, released in mid-March. Overall, Fannie stated, Federal Reserve officials' remarks suggest that employment and inflation environments have recently evolved in a way that supports a rate hike. "Even without more clarity on fiscal policy, the Fed appears ready to continue monetary normalization this month," the report stated. "Meanwhile, the Fed's favored measure of infla - tion—the Personal Consumption Expenditures deflator—jumped 0.4 percent in January from the prior month and 1.9 percent from last January, the strongest annual rise since October 2012 and just one- tenth below the Fed's target." Excluding food and energy items, the report continued, core inflation was relatively stable, ris - ing 1.7 percent from a year ago for the fifth time in six months. Despite its somewhat bullish hopes for this year, Fannie reported that Q1 growth numbers for the GDP will likely be behind Q 4 numbers, which would make Q1 the fourth consecutive time that growth has decelerated to start the new year. Fannie revised its origi - nal 1.9 percent annualized GDP growth predictions to 1.6 percent, due mainly to a drop in consumer spending in January. However, Fannie stated, despite signs of a marked slowdown in the second quarter (about half a percent), consumer spending should continue to drive growth this year, supported by improving labor market conditions. "The February jobs report showed back-to-back strong job gains, with nonfarm employ - ment rising 235,000 on the heels of modest revisions to the prior two months," the report stated. "The three-month average job gain climbed to more than 200,000, the best showing since last September, and annual growth in earnings re - bounded to 2.8 percent, just below the expansion high of 2.9 percent seen at the end of last year." Residential construction payrolls also posted a solid gain, extending a string of at least 18,000 jobs added per month since last November, the report stated. The household survey showed the unemployment rate edged down to 4.7 percent despite a large jump in the labor force, and the unemployment rate fell two-tenths to 9.2 percent. "According to the Fed's Financial Accounts of the U.S., household and nonprofit organiza - tion net worth—the value of assets minus liabilities—increased $2 tril- lion in the fourth quarter of 2016 to a record high of $92.8 trillion, boosted by gains in both hous- ing and stocks," Fannie reported. "Notably, net worth as a share of disposable income rose to 650 percent, also a record high." 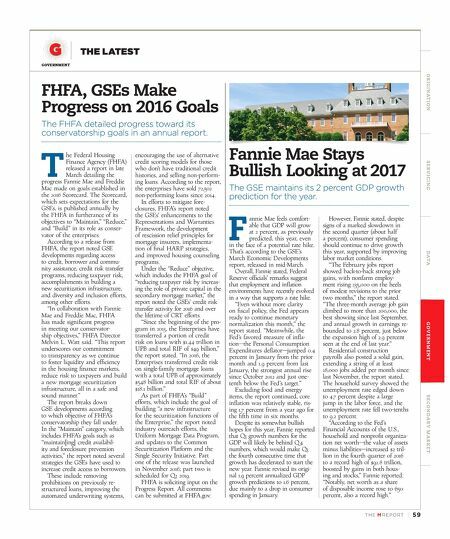 FHFA, GSEs Make Progress on 2016 Goals The FHFA detailed progress toward its conservatorship goals in an annual report. T he Federal Housing Finance Agency (FHFA) released a report in late March detailing the progress Fannie Mae and Freddie Mac made on goals established in the 2016 Scorecard. The Scorecard, which sets expectations for the GSEs, is published annually by the FHFA in furtherance of its objectives to "Maintain," "Reduce," and "Build" in its role as conser - vator of the enterprises. 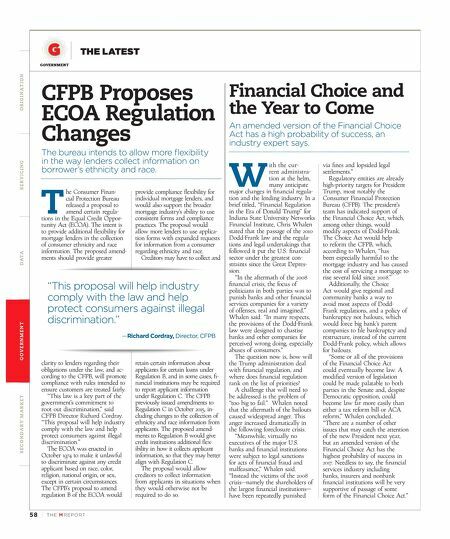 According to a release from FHFA, the report noted GSE developments regarding access to credit, borrower and commu - nity assistance, credit risk transfer programs, reducing taxpayer risk, accomplishments in building a new securitization infrastructure, and diversity and inclusion efforts, among other efforts. "In collaboration with Fannie Mae and Freddie Mac, FHFA has made significant progress in meeting our conservator - ship objectives," FHFA Director Melvin L. Watt said. "This report underscores our commitment to transparency as we continue to foster liquidity and efficiency in the housing finance markets, reduce risk to taxpayers and build a new mortgage securitization infrastructure, all in a safe and sound manner." The report breaks down GSE developments according to which objective of FHFA's conservatorship they fall under. In the "Maintain" category, which includes FHFA's goals such as "maintain[ing] credit availabil - ity and foreclosure prevention activities," the report noted several strategies the GSEs have used to increase credit access to borrowers. These include removing prohibitions on previously re - structured loans, improving the automated underwriting systems, encouraging the use of alternative credit scoring models for those who don't have traditional credit histories, and selling non-perform - ing loans. According to the report, the enterprises have sold 72,502 non-performing loans since 2014. In efforts to mitigate fore - closures, FHFA's report noted the GSEs' enhancements to the Representations and Warranties Framework, the development of rescission relief principles for mortgage insurers, implementa - tion of final HARP strategies, and improved housing counseling programs. Under the "Reduce" objective, which includes the FHFA goal of "reducing taxpayer risk by increas - ing the role of private capital in the secondary mortgage market," the report noted the GSEs' credit risk transfer activity for 2016 and over the lifetime of CRT efforts. "Since the beginning of the pro - gram in 2013, the Enterprises have transferred a portion of credit risk on loans with $1.44 trillion in UPB and total RIF of $49 billion," the report stated. "In 2016, the Enterprises transferred credit risk on single-family mortgage loans with a total UPB of approximately $548 billion and total RIF of about $18.1 billion." As part of FHFA's "Build" efforts, which include the goal of building "a new infrastructure for the securitization functions of the Enterprise," the report noted industry outreach efforts, the Uniform Mortgage Data Program, and updates to the Common Securitization Platform and the Single Security Initiative. Part one of the release was launched in November 2016; part two is scheduled for Q2 2019. FHFA is soliciting input on the Progress Report. All comments can be submitted at FHFA.gov.